Picnics bring to mind lazy afternoons soaking in the sunshine while watching the clouds float by in a kaleidoscope of shapes — it sounds perfect, doesn’t it? Wicker baskets and, of course, a blanket to spread your picnic on are must-haves. Picnic food can vary from the ultra-simple loaf of French bread and cheese slices accompanied by a cluster of grapes to the old-fashioned fried chicken and potato salad with chocolate cake for dessert variety. We have some picnic-type-food recipes to share with members of our apartment community at Icon Student Spaces. Plan a picnic soon and head to your favorite St. Louis park to enjoy it. Portable food is one the key factor when preparing a picnic. Try something a little different: take some fresh salsa and chips for your picnic. We have a tasty recipe for you to try. Stir together the first 7 ingredients. Season with salt and pepper to taste. Cover and chill until ready to serve. Serve with chips or over salad greens. — If you want to go with traditional picnic foods like Fried Chicken and Potato Salad, with Chocolate Cake for dessert, the Cutestuff Cooks blog has recipes for all three! Butter the bread before adding the filling. The butter acts as a barrier, and the bread won’t get soggy — or pack the sandwich fillings in separate plastic bags and assemble the sandwiches on site. This allows individuals to build a custom-made sandwich. Invest in some packets of mayo and mustard; this reduces the chance of spoilage and it’s more convenient to take small packets than the big jar. Leave the sandwich partially in the wrapping while you eat it. If it drips, the wrapping will catch the drips. Think outside the breadbox for sandwiches. Serve chicken salad with croissants, fill pitas with tuna salad, or make lettuce or tortilla wraps. Delish offers Picnic Sandwich Ideas to help get you started with your next picnic! Where is your favorite place to picnic in St. Louis, MO? 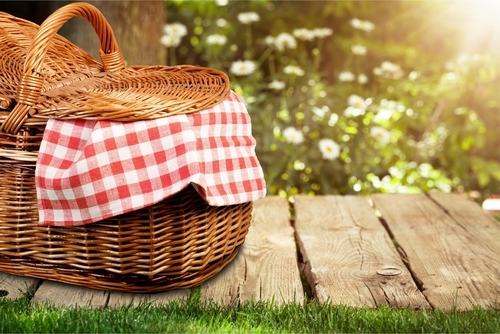 What kind of food do you like to take on a picnic? Thanks for reading today’s post.